Aretha is the self-titled pop debut album of the future "Queen of Soul" Aretha Franklin, for Columbia Records, released in 1961. Following in the footsteps of close friend Sam Cooke, Aretha was "discovered" by famed Columbia Records producer John H. Hammond. With the support of her father, Reverend C.L. Franklin, Aretha venured out to New York City's Columbia Record Studios to record her debut album for the label. John Hammond paired Aretha Franklin with the Ray Bryant combo and arranger J. Leslie McFarland, while taking charge of the album's production, which was received to mixed reviews. 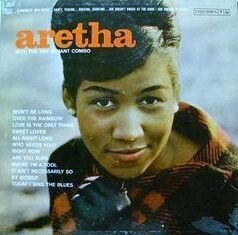 The album showcases a young Aretha Franklin (only 19 years old, at the time of these recordings), covering a range of jazz and pop standards. Columbia Records couldn't clearly classify Aretha's sound, as either jazz or pop. Aretha's subsequent albums would show her moving from the realms of both sounds, and audiences as she tries to define her "own soulful sound". Though rare to find an original 6-eye pressing on vinyl, Columbia Records re-released these sessions and retitled them as "The Great Aretha Franklin: The First 12 Slides", in 1972.